the original engine seems to run out of torque in the top end, with 14 x48 gearing im only scratching 160 kph on bitumen, 145 kph on hard gravel , am wondering if the comp map might be the next step to boost the topend?? anyone run a euro or comp map??? I've had my 570 to around the 190 on tarmac and would have probably squeezed a little more out of it if I had the road. Was accelerating ever so slightly. That was with 14 x 38 gearing I think (the rear sprocket that was delivered with the bike). I get to 180 pretty quickly, faster than my mates 696 Monster. He crawls past at that point. So I would investigate further. I was around the 100hr mark when I did those runs. Currently at 115hrs and 5800k's. Motor feels strong and tight. Haven't checked the valves since the 50hr mark, but they hadn't budged then so will leave it until around 150 before I have another look. My 2011 FE 390 has 312 hours and 12,000km on the clock. Other than the usual oil changes, valve clearance checks, DT CCT and a replacement fuel pump in 2012, it hasn't missed a beat. I was thinking it must be getting time for a new piston/rings, but after reading this thread, I might just keep riding it. 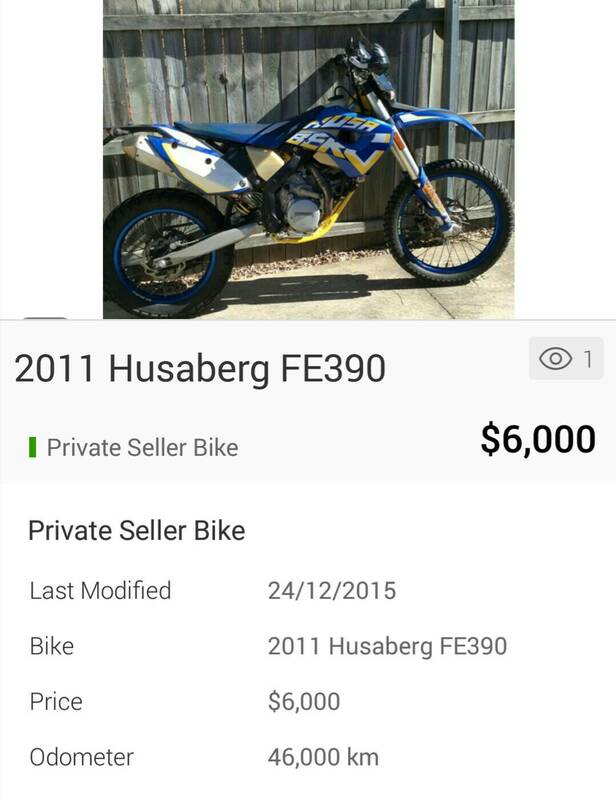 There's one on bikesales with 46k km on it wiggy, says has not been ridden since top and bottom end rebuild. Would be interesting to know what he got out of it..
390/450/570 all have the same crank just different rods/pistons correct??? No they have different cranks. yes they must be slightly different to get a different stroke but the weight/design is almost exactly the same or not??? 390/450 have the same bore, but the 390 has a longer rod with less stroke. 570 has bigger bore and different stroke. So all machines have different cranks. The intake lobe on the 390/450 is different from the 570, but outlet lobe is the same. The clutch springs on the 570 are harder than on 390/450 and they use different curves in the ECU. Apart from that the engines/bikes are the same. So if this is correct you can rebuild a 390 to a 450 just by buying a different crank. And you can rebuild a 390/450 to a 570 with a new crank, cylinder/piston, cam and clutch springs (not sure about the head...). Think 570 header is bigger diameter pipe.